This is one of my favourite dal recipes and also one of the simplest I know. 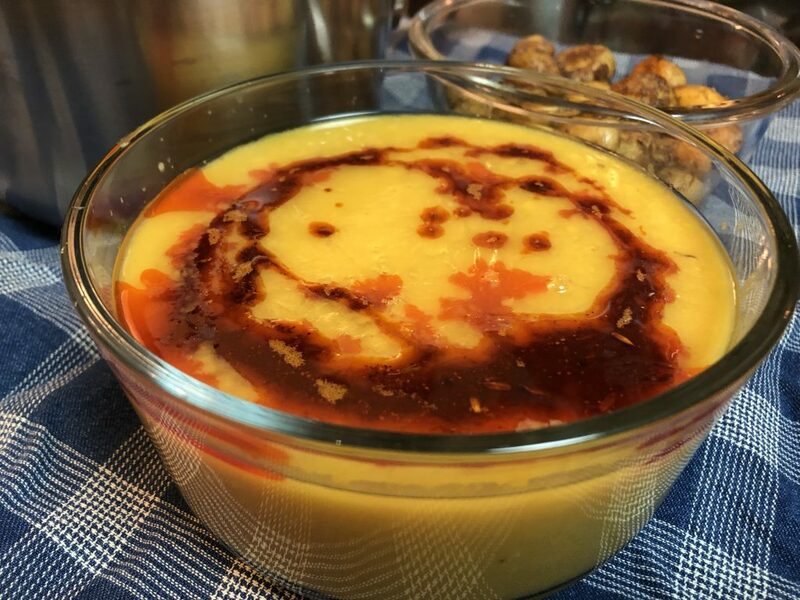 This Old Delhi style creamy Arhar dal with heeng jeera chaunk (tadka) is a recipe from my maternal grandmother. My maternal grandmother or Chaiiji, as we all fondly called her, grew up in Old Delhi. While my maternal grandfather or Bauji was from Punjab and liked all things punjabi, Chaiji brought a lot of food influences from Old Delhi in the family. She was also a vegetarian and did not even eat food with onion and garlic. So, a lot of the food she made was very simple in terms of ingredients but still very flavourful. Like the sabzi she made, often used just some jeera, oil and basic spices on the vegetable. The word tadka is often used for punjabi or north Indian food. But when one uses the word chaunk (छौंक), you know the comes from old Delhi and the Northern plains. Don’t miss the onomatopoeia here! For the uninitiated, tadka and chaunk refer to tempering. A simple Arhar dal (also called Toor or Pigeon pea) with no garlic or onions may seem boring to some, but the believe me, this recipe’s pizazz comes from the heeng jeera chaunk. A bright yellow dal topped with a drizzle of this fiery red heeng jeera chaunk tastes as delicious as it looks. 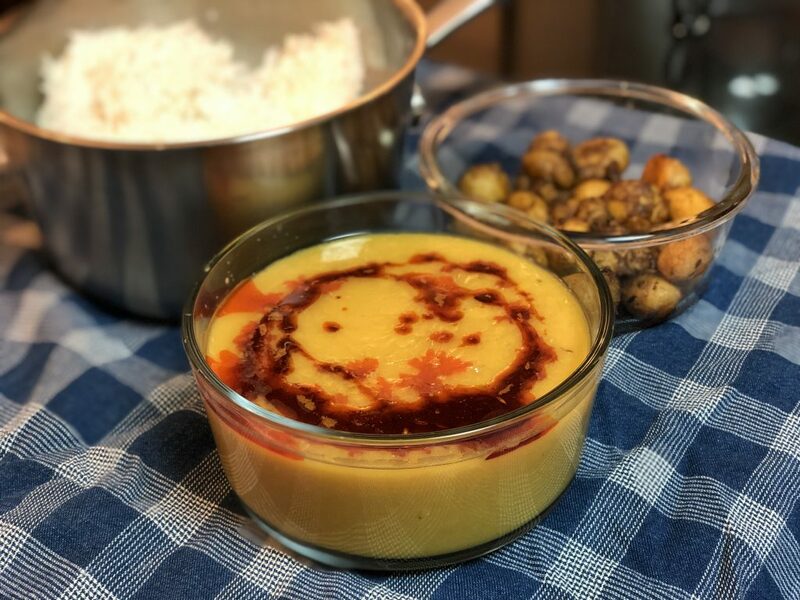 This arhar dal with its chaunk can be made when you have no fresh produce in the house. It is a pantry recipe that is perfect around the days of travel when you are trying to finish produce or have none around. I serve this with dish with steamed rice and a side of sookhi sabzi. If I don’t have any vegetables, then there is always pickle in the pantry. 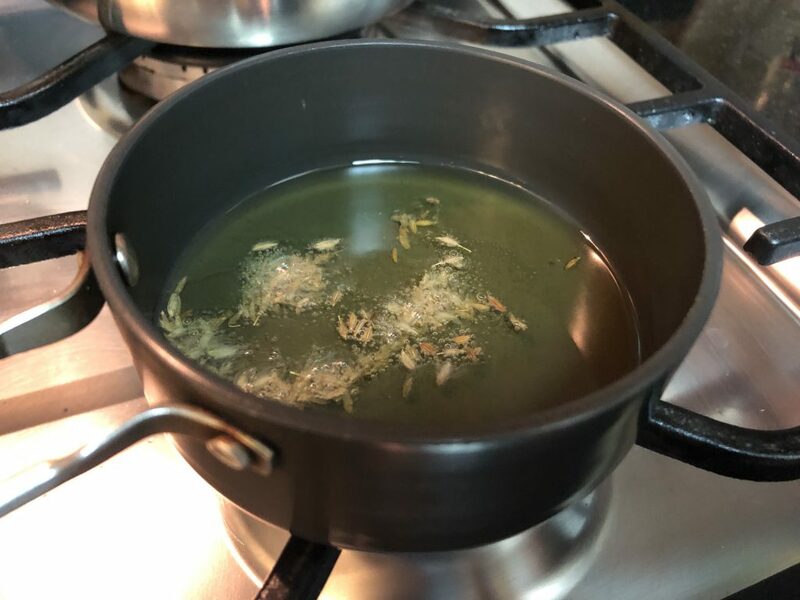 But in case you thought that a side is necessary to add flavour to this simple dish, let me assure you, that the Heeng Jeera chaunk is usually enough. People often put a spoonful of ghee over their food. Be it over khichdi, pulao or dal chawal, Ghee adds a nice touch to these rustic home cooked meals. And this heeng jeere ka chaunk packs a great flavour. The version of the heeng jeera chaunk that I make has Kashmiri red chilli powder. You can choose to skip the red chilli powder in case you don’t want your dish to be too hot or use the Kashmiri variety of red chilli. This tadka balances the creaminess of the arhar dal and gives it a nice kick. The heeng or asafoetida in the chonk is an essential ingredient in this recipe. Heeng is a resin derived from a plant. 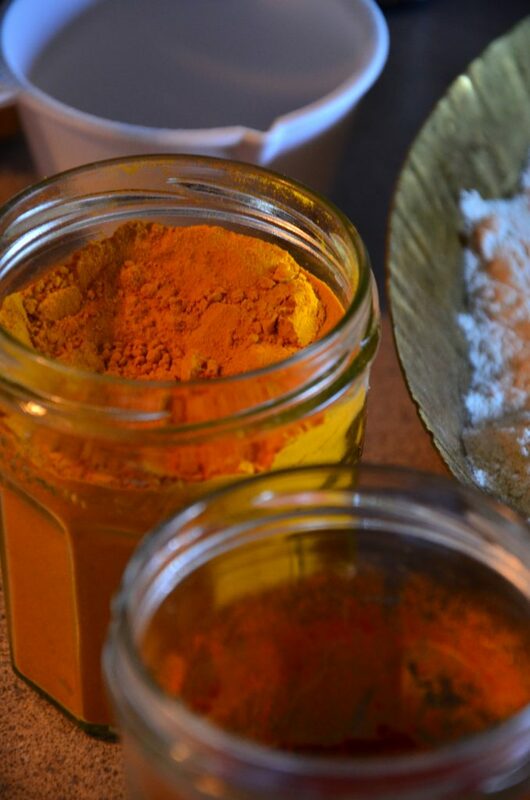 It is known to have digestive and anti-inflammatory properties. And since Arhar is one of the heavier Indian dals and in a lot of households is made almost every day, it is essential to make this dish easy on the digestive system. In this recipe, I add heeng while cooking the dal and then again in the tadka. 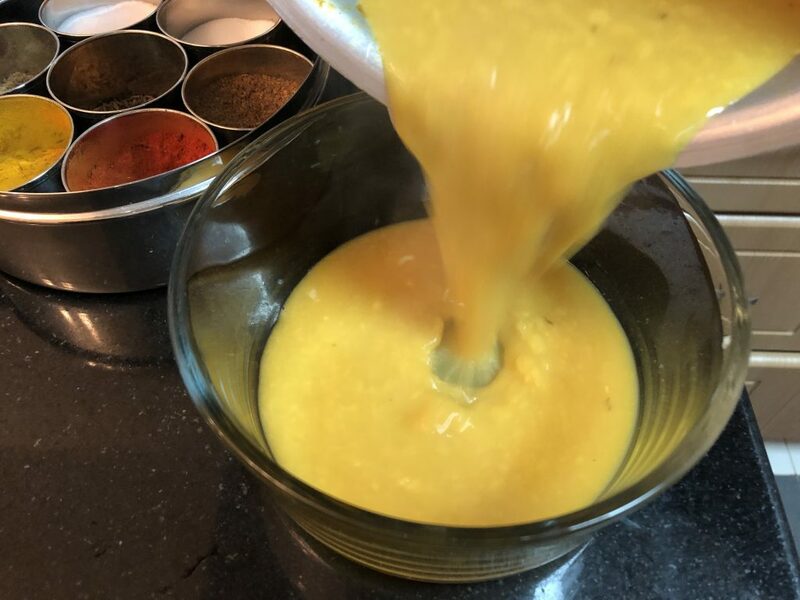 If you find the flavour of heeng too strong or pungent, you can skip adding it during cooking the dal or else just use lesser amounts. Start by measuring the dal and transferring it into a big bowl. Next, rinse the dal with water a 4-5 times till the water is a bit clearer. Measure around 2 and a half cups of filtered water and pour over the dal to soak it. If you have time, you can let the dal soak for 20 to 30 minutes. But if not, it is fine. 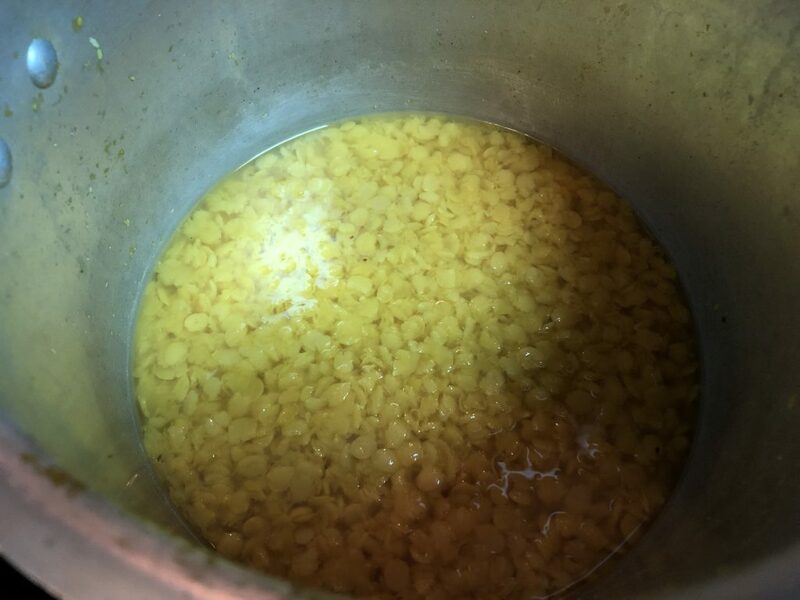 You can cook the dal for a few extra minutes in the pressure cooker on low heat to get the desired consistency. Transfer the soaked dal in the pressure cooker or a big saucepan. Add salt, turmeric powder and heeng and place the pressure cooker on medium high heat. Cook till you hear 1 whistle from the pressure cooker and then turn the heat on medium low. Cook on medium low for 7-10 minutes. If you are using a saucepan, cover the saucepan and cook till the lentils become soft enough to be mashed. After 7-10 minutes, take the pressure cooker off heat and let the steam escape on its own. Once the steam escapes from the pressure cooker, open the cooker carefully. 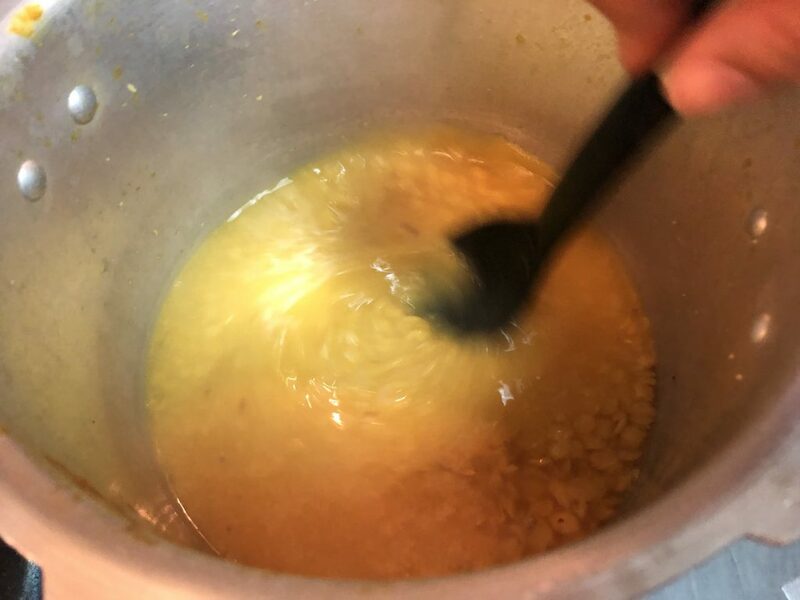 Stir the dal vigorously with a ladle to mash the dal and make it creamier. 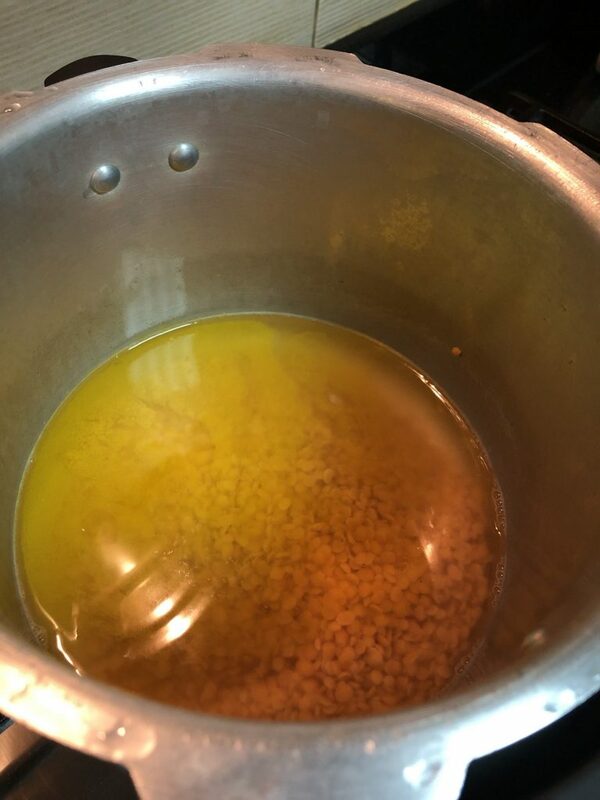 If you feel the dal is too thin for your liking, you can adjust the consistency by cooking it without the lid for a few more minutes. If it is too thick, add a splash of hot water and stir it in to incorporate. 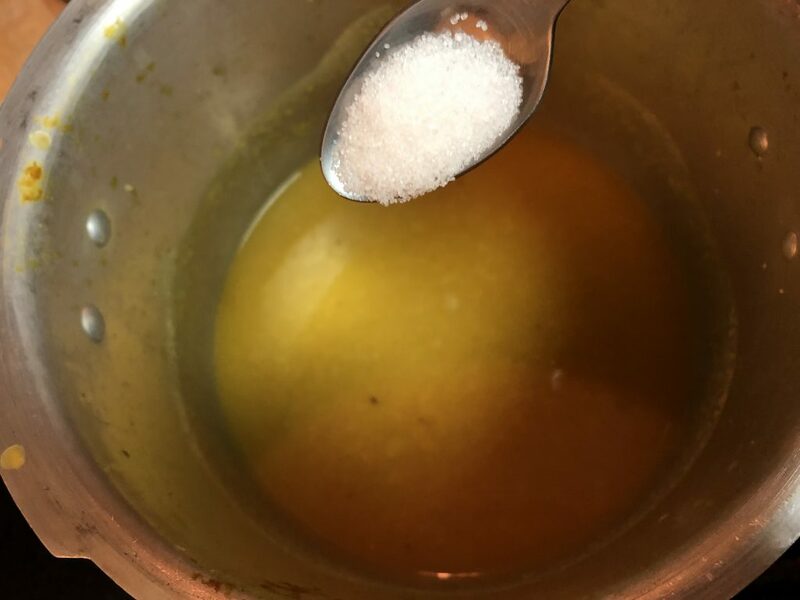 Next, throw in the sugar and mix it well in the dal. The sugar rounds off the dal’s flavour nicely by balancing out the savoury. The sweetness also lends to the creamy consistency of the dal. Transfer the dal in a bowl. Before you start with this tempering, gather all the ingredients as you cannot overcook the spices in the ghee. The chaunk can be prepared in less than 2 minutes. I also recommend you switch on the exhaust as the spices in hot oil can be a very strong smell. Start by placing a small pan on low heat. Add a spoonful of ghee and let it melt. 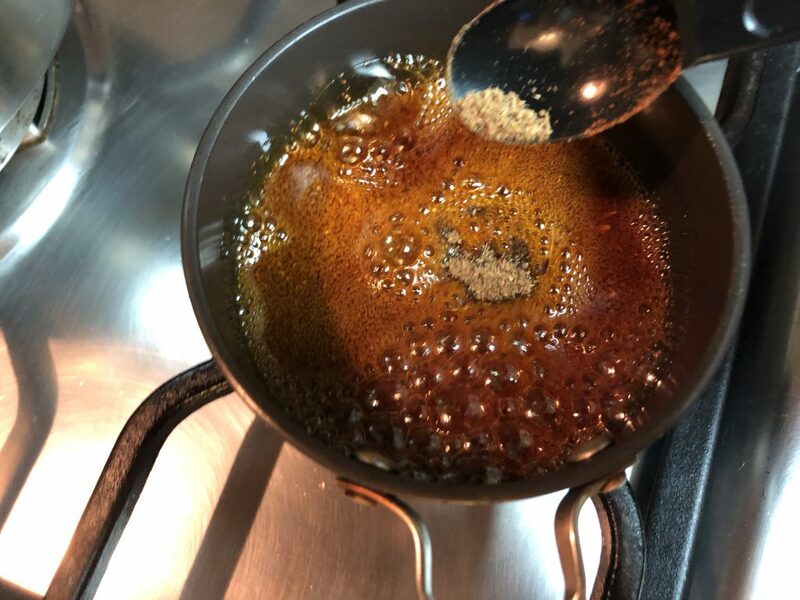 As soon as the ghee melts, add a pinch or two of heeng and let it sizzle for around 5 seconds. Next throw in the cumin seeds and let them bloom for around 10 seconds. These spices should sizzle in the ghee if the ghee is hot enough. If not, wait for the cumin to bloom or just change its colour slightly. Whatever you do, do not turn up the heat! 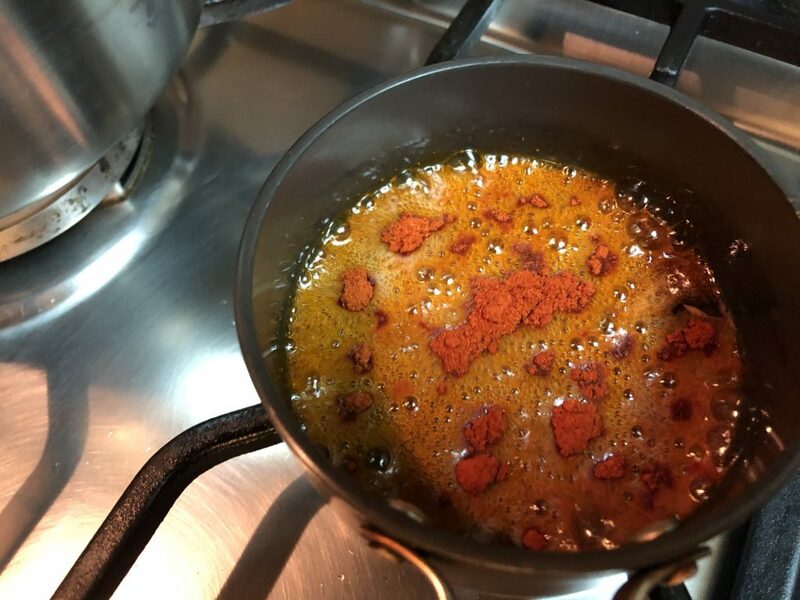 If the ghee is too hot, it will burn the spices. Next, add the Kashmiri red chilli powder and stir it in. Follow with a quarter teaspoon each of coriander powder and garam masala. Stir the ghee for a few seconds and take the pan off heat. The spices will cook in the residual heat of the pan. The chaunk is now ready! To serve pour the heeng jeera over the cooked Arhar dal. Serve this creamy Arhar dal with a drizzle of the Heeng jeera chaunk and with steamed rice. A creamy Arhar Dal served with a drizzle of flavourful chaunk, a tempering made of ghee, asafoetida and Indian spices. Start by measuring the dal and transferring it into a big bowl. Rinse the dal with water a 4-5 times till the water is a bit clearer. 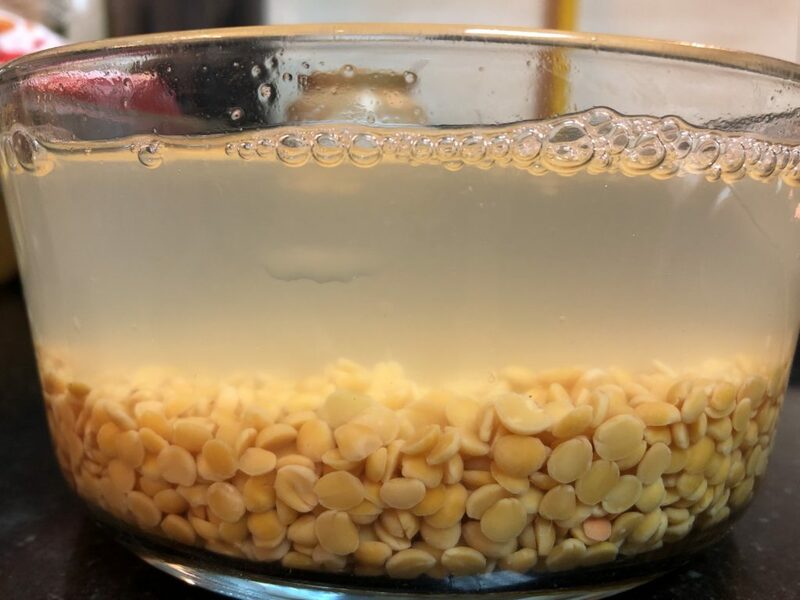 Measure around 2 and a half cups of filtered water and pour over the dal to soak it.